An A I like it despite the fact that Talia didn't stay would have been another good story line involving her growing powers from Ironheart and it always good to see Bester again. I happened to watch this episode again last night. I think its one of the weaker Bester episodes, and in since Talia was written out of the series it has become just a throwaway episode, which it was never meant to be. However, Walter Koenig is good value as always, and the leader of the rogue telepaths gave an interesting performance. Plus we see Sheridan go up against Earth Alliance for the first time- over the rent of his quarters! Talia's leaving doesn't make this "throw away." 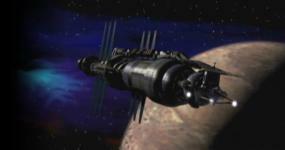 It establishes the rift between Psi Corps and teeps who are fighting against it or escaping it. LOVE this one! The first A I give, actually. When we first hear of the underground, I think you will agree that we all mentally went "Susan." right away. But it's not, it's that quiet moral giant of a doctor. And that "Oops!" scene is classic! I love the underground teeps, the scene where they relate their experiences really makes us see how low the Corps will go, even as far as the forced impregnation of teenagers. Talia completely doesn't want to hear this, it's like finding out your parents are murderers, but she has the strength to accept it and stand with them. The illusion scene is brilliant. I'll always remember the first time I watched Talia open fire, completely believing it with my heart in my feet, like "Oh God....No." then the confusion as they're all standing there again! JMS was a cruel man somedays! Oh, and: "As a soldier I am honour-bound to uphold the law!" and Micheal: "Want, agree, that has nothing to do with it." In hindsight, ooh the irony! I think this is my favorite Talia episode. I think the episode dull but rescued by the humorous subplot.. How many Minbari does it take to screw in a lightbulb? The thing is .. also if Talia left, her story plot obviousley went on - through the Psi Corps in general, through Bester, mostly through Lyta. It's something JMS does a lot, transfering plotlines from one character to another if things don't work the way they were planned for whatever reasons. I'm SURE Sinclair was going to get together with Delenn eventually if he had stayed, after Catherine was lost in deep space on a survey mission .. to Z'ha'dum (Sinclair's other girlfriend, Caroline, was a freighter captain .. so a similar plan could have been in storage for her too) .. I'm sure that most of Takashima's plot was given on to Talia too in the end. So Talia leaving doesn't really make this episode a throw-away in any way. This episode is interesting especially from the arc aspect - Psi Corps and the rogue telepaths tie into future developments including the fifth season (though I find the teeps here more simpatico than Byron and Co.!). We see Bester at his cruelest in the Mars scene, yet convinced that he is doing good and trying to get others to approve of him. It's interesting to see the tie-in between Dr. Franklin's clinic in Down Below, previously established, and his work for the underground railway. I like those threads that carry over from one season to another. By the way, did anyone else notice that the "Mary had a little lamb" poem was misquoted by the telepaths? They chanted "her fleece was white as snow" - the original has "its fleece". I wonder if that's a mistake or something intentional. I find the joking Sheridan very annoying! I can feel with Ivanova in that situation - and when she finally thinks she can catch up on sleep, she's interrupted by Talia. That, however, is an interesting development in their relationship. I like the way it has built up very gradually, amost unwillingly - that makes it plausible. Sheridan follows in Sinclair's footsteps in using Earth Gov's rules against them in his/B5's favour when he appropriates the credits for the extra rent from the budget - a nice touch! One last thought - isn't it interesting that the scariest bad guys are those who are extremely polite?! Bester and Morden share that trait, and the contrast to their actions is deeply disturbing because of it. Last edited by Estelyn; May 28th 10 at 21:48. I think that's part of why the Gentlemen in Buffy The Vampire Slayer's "Hush" are so scary: they're so polite about cutting out someone's heart with a scalpel while they can't scream. If I remember correctly, jms did very accurately state "the monster doesn't see itself in the mirror" (or some statement similar to that).